A dying man gives the money mad bunch a clue. That begins the mindless comic race to Janakpur zoo where the stolen money has been kept. Each duo is worse than the other and the slapstick comedy does make you laugh in bits, but mostly you can see the joke coming at your from a mile away. Kids might find the scenes with CGI zoo animals good fun. This multi-starrer is a thoroughly entertaining comic ride. 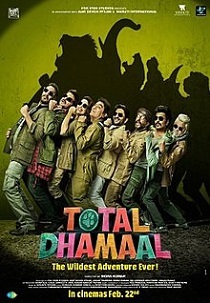 On the whole, TOTAL DHAMAAL is a 'leave-your-brains-behind-at-home' entertainer with its share of funny moments. If you are not looking for wisdom and rationale in a light-hearted entertainer, then this movie is definitely for you. At the box office, it’s only the masses who might give the film thumbs up and they’ll majorly determine the fate of the film from Monday onwards. The ensemble star cast aside, this pursuit for comic adventure turns into a misadventure. The Movie Lacked Three Things: Entertainment, Good Jokes, Strong Story! It Had One Job… To Make Us Laugh!